The wooden goblets below are in stock and ready for delivery! Please note that each is a one of a kind. If you would like to purchase multiple goblets in the same style, please read below. Click on the goblet picture for details and purchasing information. 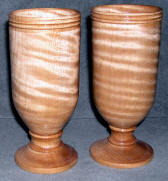 Visit our second page of hand carved, hand turned wooden goblets for sale! Or even our third page of Wooden Goblets which features figured & exotic wooden goblets!